Strawbery Banke Museum celebrates “Once Upon a Winter’s Eve” during the 34th annual Candlelight Stroll, December 7-8, 14-15 and 21-22, 2013. The event takes place from 5 to 9 pm on Saturdays and 4 to 8 pm on Sundays. Candlelight Stroll is generously supported by Bank of America, the New Hampshire State Council for the Arts, Lincoln Financial Group, Liberty Mutual Insurance Group, Amica Insurance, The Provident Bank, Newburyport Five Cents Savings, R.M. Davis, Inc, The Mark Wentworth Home, Kennebunk Savings, the Sheraton Portsmouth Harborside Hotel, Darrell’s Music Hall, Bruce Mast & Associates, Inc., Northeast Credit Union, and Wentworth Greenhouses. Showcasing 350 years of seasonal and holiday traditions against the backdrop of the Museum’s furnished historic houses. On these weekend evenings, the Museum grounds glow with hundreds of lighted candle lanterns, the houses are adorned with thousands of hand-made decorations crafted from live greens and dried flowers and herbs collected from the Museum gardens, and the air is filled with the sound of holiday music and scent of woodsmoke. SHAPLEY-DRISCO HOUSE — 1795 Snowy Days on Puddle Dock and a 1958 Holiday Avon Party. — Live music, cookies & hot cider at the Cider Shed. — bundle up on Puddle Dock and enjoy this age-old tradition. — Families learn wreath-making and create handmade holiday decorations in the Jones House. — Savor 18th century holiday hearth cooking and tinsmith crafting handmade lanterns and tin star ornaments in the Wheelwright House. Avoid lines by purchasing tickets in advance! Tickets can be purchased in advance in person at the Strawbery Banke Visitors Center at 14 Hancock Street up to the date of the event. Advance tickets may also be purchased online at www.strawberybanke.org starting November 1st. Tickets are $22/adults, $11/children (ages 5-17), and $55/family. Group and corporate rates are available. November discount: $2 off the ticket price on all tickets purchased by November 30, 2013. 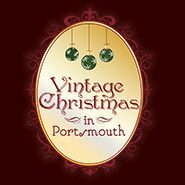 Visitors who are concerned about parking for this popular event can enjoy all that Portsmouth has to offer hassle free with the FREE Vintage Christmas trolley connecting Strawbery Banke Museum, The Music Hall, the municipal parking garage on Hanover Street, and numerous free satellite parking areas. The trolley is generously provided by the City of Portsmouth as part of a Vintage Christmas in Portsmouth. The Vintage Christmas collaboration aims to highlight the rich seasonal programs of Strawbery Banke Museum and The Music Hall, and is the result of a fruitful collaboration among the City of Portsmouth, Strawbery Banke Museum, The Music Hall, the Greater Portsmouth Chamber of Commerce, and local hotels and retail shops.